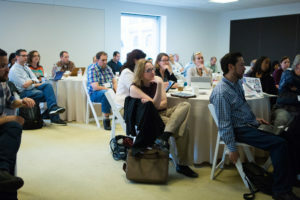 Researchers shared their findings on a variety of online journalism trends at a breakfast panel held April 22 at the 18th annual International Symposium on Online Journalism (ISOJ). Talia Stroud, director of the Engaging News Project at The University of Texas at Austin, shared some of the project’s findings, which aim to provide research-based techniques for engaging audiences. They surveyed more than 12,000 commenters on over 20 different news sites and asked people what they wanted from comment sections. They found that no matter how large or small the news site, the audience wanted to see experts involved in the comments section and journalists to answer factual questions. Stroud also found that push notifications led to more app usage and knowledge. In addition, participants in an older age group were more receptive toward the push notifications, responding they were more likely to keep them on. This finding, according to Stroud, should make newspapers think twice about their targeted audience. 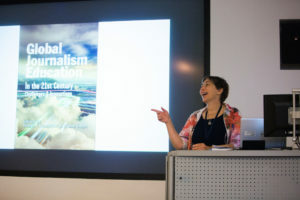 The launch of the book, which was published by the Knight Center for Journalism in the Americas, coincided with the 18th ISOJ. It is the Knight Center’s first project in its new initiative to publish international academic research on journalism. The book includes collaborations from journalism education experts around the world. The articles center on country case studies, provide insight into the current state of journalism education and highlight innovations in the field. Marcus Messner, associate professor at Virginia Commonwealth University, shared his findings on how newspapers use Instagram for political coverage. With 600 million users, Instagram has potential as a news platform and some newspapers have taken notice. Messner found there was a big focus on anti-Trump protestors on Instagram, as all newspapers displayed them as their most frequent content. There was a positive portrayal of protestors and a much more negative portrayal of President Trump’s administration. But the overall way in which newspapers engage in Instagram is still very different, Messner said. The overall Instagram engagement, according to Messner, reminded him of the early days of Twitter experimentation. Twitter was launched in March 2016 but really took off a year later during SXSW, also held in Austin. 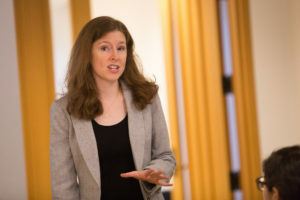 Rachel Mourao, associate professor at Michigan State University, shared her research on how journalists navigated political turmoil in Brazil during a conservative populist wave of protests that hit the country in 2015. She studied 1,500 Brazilian journalists who covered the protests and matched the survey data with stories they wrote. Mourao said that traditionally, journalists tend to focus on violence between protestors and police. However, during the 2015 protests, the demonstrators really supported the role of the riot military police protecting their safety — and journalists were sure to portray that truth. Mourao also found that Brazilian journalists use Twitter for personal reasons, rather than as a tool for news, perhaps because Twitter has not been normalized yet in that country.